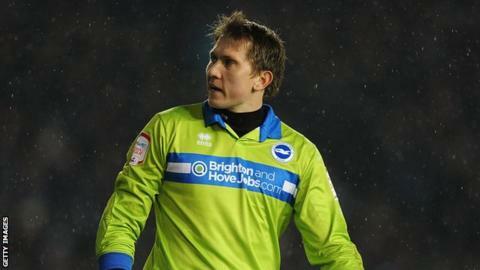 Brighton goalkeeper Tomasz Kuszczak says there is little margin for error if his side want to secure a Championship play-off place. The Seagulls are two points off the top six with a game in hand following their 2-0 win over Cardiff on Tuesday. The 30-year-old told BBC Sussex: "The quality is definitely there. "There were many games we should have won but we couldn't score and it cost us a lot of points. Now is a time where there is no place for any excuses." He added: "We have believed all season long and we need to perform." The Poland international joined Albion on a free transfer last summer, and said on the eve of the season that his goal was to win promotion. "I would love to go back to the Premier League," he said. "I spent many years there and I came down to Brighton because I believed we can achieve that. "I hope it will be this season. If not, then definitely the next one." Brighton first team coach Charlie Oatway heaped praise on the former Manchester United stopper following a string of saves against the Bluebirds. "Everyone knows Tomasz is arguably one of the best goalkeepers outside of the Premier League," said Oatway. "Some of the saves he makes don't surprise me because he does it on a daily basis." Kuszczak was understandably pleased with keeping a clean sheet in Wales. "Cardiff put a lot of pressure on us," said the Pole. "We expected that as they are a team of many qualities. "In games like that I expect to have a lot of work. "We defended as a team together and obviously I had my job to do. I am happy I helped and kept a clean sheet. "I hope we can take this form into our home games and give the crowds wins like this at home."